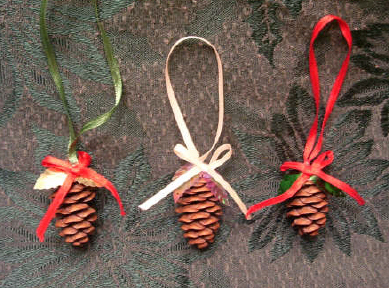 You will need two pieces of ribbon per pinecone-each piece should be approximately 5 inches long. Loop the first piece of ribbon, making a half circle, attaching each end to the top of the pinecone. Glue this in place. While glued ribbon is drying on the pinecone, take this time to make your bow (your second piece of ribbon) to glue over the two ends of your first ribbon at the top of the pinecone. After the glue is dried, you can embellish the pinecone with berries or leafs-anything that will make the pinecone sparkle in the light of your Christmas tree! I used mylar leafs-found at the craft store by the sequins. I think even something as simple as plastic berries 'brushed' with glitter glue would look beautiful. To do this, take a small craft brush and dip it into the glitter glue. Paint this right onto the berries. You could also paint just the pinecone with the glitter glue. Really the imagination and options are limitless with this Sparkling pinecone! Copyright © 2007 by Mary Nienhouse. All rights reserved.